Every month or so the OTW will be doing a Q&A with one of its volunteers about their experiences in the organization. The posts express each volunteer’s personal views and do not necessarily reflect the views of the OTW or constitute OTW policy. Today’s post is with Rachel G., who volunteers as a graphics volunteer for the Communications Committee. As a volunteer graphic designer for the Communications Committee I create graphics that are used across multiple platforms to promote OTW events and materials. 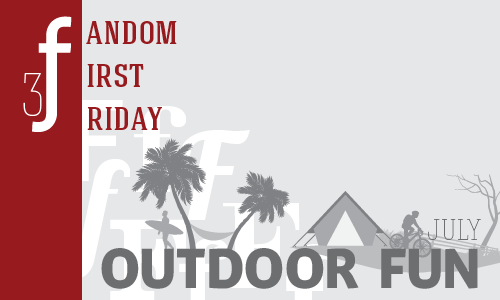 I primarily work on graphics for OTW tumblr events such as the Fandom First Friday. These F3 graphics are used to announce the monthly theme of the tumblr multi-fandom discussions and posting events each month. My work as a volunteer depends on the committee’s needs and/or the time of the month. Since I have a full time job as a designer at an ad agency, my OTW activities are generally constrained to the weekends. Communications has been great about giving me long lead times on projects so that my volunteer work doesn’t become overwhelming. I spend most of my time working on the Fandom First Friday graphics. I usually spend an hour or two conceptualizing how to visually represent the F3 theme (sometimes longer for the more abstract themes) and then take a few more hours to putting together the final graphic on the weekend before each month’s Fandom First Friday. What is your favorite graphic that you’ve made? I’ve enjoyed all of the F3 graphics that I’ve made over the years but there are so many that I’d be hard pressed to choose one. Instead, I’d say that my favorite graphics have to be the OTW anniversary graphics. I’m partial to the 8th anniversary graphic in particular. Seeing things that I’ve created out in fandom and how people receive them has to be one of the most fun aspects. The creation process is pretty solitary for me so it is rewarding to know that my graphics are leading people to OTW events and discussions where they can interact with other fans. I’m a huge fan of fantiction and I’ve been engaging with fandom through it for the last 15+ years. As you can imagine I’ve been in and out of quite a few fandoms over the years (LoTR and Ronin Warriors were the start). I’ve used fanfic archives, Yahoo Groups, LiveJournal, Fanfiction.net, AO3, and tumblr among others so I know just how important what OTW does is for fandom. I’ve seen the good (even great), bad, and ugly that can from fandom and I still keep coming back for more. I can’t get enough of seeing and reading other fans’ passion for the things that I love.